The risk tool provides parcel-based risk information on floods, wildfires, landslides, dams, and winter storms. This tool helps Buncombe County generate maps and reports required for hazard mitigation plans. The Internet application was developed with ArcGIS API for Flex. 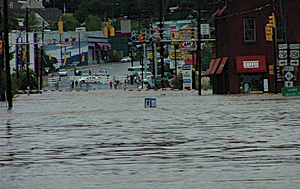 In September 2004, the Asheville, North Carolina, area experienced severe flooding from heavy rainfall caused by the remnants of Hurricanes Frances and Ivan. Portions of the Asheville area received up to 20 inches of rain, leading to extensive flooding and inundating many roads, bridges, houses, and businesses. The large volume of water also damaged the main water line in Asheville, resulting in much of the city being without water service for several days. A federal state of emergency was declared in North Carolina; the damage in Asheville, surrounding Buncombe County, and nearby counties in the western half of the state was estimated by the US Federal Emergency Management Agency (FEMA) to exceed 240 million dollars. The Buncombe County Multi-Hazard Risk Tool uses GIS to show parcels affected by natural hazards; here, the Risk Tool displays the parcels in the 100-year floodplain. The 2004 flood is just one example of the many natural hazards that affect Buncombe County and the City of Asheville. The area is also threatened by landslides, wildfires, high winds, and winter storms. To plan for disaster mitigation and response, the Buncombe County Emergency Operations Center (EOC) is required by FEMA to submit an updated hazard mitigation plan every five years. The Buncombe County staff is a longtime user of ArcGIS, which it uses extensively for mapping and reporting needs in several areas, including tax parcel management, planning and zoning, emergency response, and soil and water conservation. While the Buncombe County GIS staff is very responsive to EOC requests, EOC staff desired a solution that would let it view hazard datasets and generate maps and reports from the desktop. In particular, EOC staff needed a tool that would show the areal extent of each hazard, the total value of property parcels at risk from each hazard, and the key infrastructure and critical resources at risk during a hazardous event. To meet these needs, the Buncombe County EOC teamed with the Renaissance Computing Institute (RENCI) engagement center at the University of North Carolina at Asheville to develop the Buncombe County Multi-Hazard Risk Tool. The RENCI engagement center is a unique collaboration between the university, multiple government agencies, and the public sector. Formed in 2006, the center focuses on decision support tools related to natural hazards, such as floods and landslides; community and regional planning; and economic development issues. RENCI staff met multiple times with staff from Buncombe County and the City of Asheville to determine the user requirements and needed datasets. RENCI staff then used Esri technology to develop the Multi-Hazard Risk Tool. An enterprise geodatabase for the risk tool stores more than 140 layers, including roads, utilities, and key structures; future land development scenarios; geographic extents for each hazard; and the parcels at risk from each hazard. Risk maps for each hazard were created with ArcGIS by intersecting a map of property parcels with maps of hazard extents obtained from trusted sources, such as the North Carolina Department of Environmental and Natural Resources, the North Carolina Floodplain Mapping Program, and the Southern Group of State Foresters. ArcGIS serves these spatial layers to the web. The user interface for the risk tool is a rich Internet application created with ArcGIS API for Flex. The application includes a map showing the data layers, with navigation controls for zooming and panning. The tool has a set of reports summarizing parcel counts and values for each hazard grouped by parcel classification and vacancy status, with documentation explaining the assumptions and models used to determine hazard risk. In addition, there is a toolkit with functions for identifying map features, finding parcels, controlling map layer visibility and transparency, obtaining map layer metadata, and creating a printer-ready version of the map. With the tool, EOC staff can answer targeted questions, such as, What is the total property value at risk from a 100-year flood? Could a flood block access to a new planned subdivision? Could a dam failure cause damage to a planned rail hub? Is there any land expected to be developed that also has a high risk of wildfire? and How many parcels have unstable land that is prone to landslides? Flooding in the Biltmore Village area of Asheville, North Carolina, after rainfall from the remains of Hurricane Frances in September 2004. The risk tool was released to Buncombe County in 2009 with improvements implemented throughout 2010. Reports and data from the tool were incorporated into the county's latest FEMA plan update. According to Angela Ledford, the deputy director for the county EOC, "One of FEMA's requirements for the Hazard Mitigation Plan is to express hazard vulnerabilities in terms of dollars. The best available data at the time the original plan was written only covered flood vulnerability, and reviewing at-risk properties and calculating potential losses took days. With the Multi-Hazard Risk Tool, we are able to run reports on additional hazards, such as landslides and wildfire, and those same reports now take only moments to produce." The risk tool was also provided to the Asheville Fire Department, which is using it to identify potential fire station locations. According to Scott Burnette, fire chief of the Asheville Fire Department, "The Buncombe County Multi-Hazard Risk Tool has been extremely beneficial as we make difficult resource decisions. This tool has also benefited us greatly as we pursue reaccreditation through the Commission on Fire Accreditation International. The planning and goal setting requirements to be an accredited agency are easily met using this tool." RENCI plans to continually update and improve the hazard models based on new data. In addition to refining its current uses, RENCI would like to upgrade the tool to consider other hazards, including tornadoes, earthquakes, and droughts. RENCI is also working to expand use of the tool to other local counties. The Buncombe County Multi-Hazard Risk Tool demonstrates an important use of an online GIS. By using Esri technology to serve datasets through the web, the risk tool helped EOC staff update hazard mitigation plans more quickly and efficiently than before. The risk tool also helps provide information to the small towns and municipalities in Buncombe County, where planners do not have extensive in-house GIS resources. By doing this, the risk tool facilitates online reporting and retrieval of geospatial information throughout the county and helps foster a common base of geographic data for hazard planning and response. Dr. Todd Pierce is a senior research scientist with the RENCI engagement center at the University of North Carolina at Asheville, where he creates online GIS and database applications. For more information, contact Todd Pierce (e-mail: tpierce@unca.edu).